I arrived in Washington DC on Thursday. It's been so sunny, warm, and beautiful here! 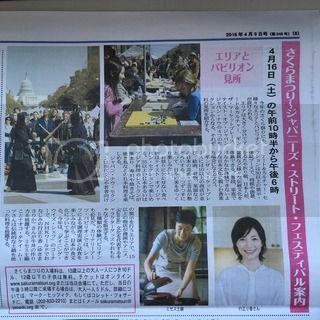 I'm invited to do a donabe cooking demonstration at Sakura Matsuri, the hisotic and big annual event in DC today. I am so excited to be part of this event and will be making a rice dish using double-lid donabe rice cooker, "Kamado-san". I'm featured in both local English and Japanese paper...it's funny that I'm introduced as "Mrs. Donabe" in the Japanese paper. This is the largest annual Japanese cultural event in the US and about 50,000 (ore more?!) people are expected to attend today! I can't wait to spread Happy Donabe Life to people in DC! !